Here’s how two expert waterfowlers find some of the hottest shooting of the year on do-it-yourself hunts to prime areas in southwestern Canada and the northwestern U.S. There is one main key to success on any freelance hunting trip on the prairies: Scouting! This country is vast, and geese and ducks don’t spread evenly across it. Instead, they concentrate in choice areas, and it’s up to you to locate these areas and gain permission to set up on them. This means hours behind the steering wheel, miles of dusty or muddy back roads, and arms tired of holding a binocular while scanning for birds. Typically the first day of a trip is spent with guns in their cases. Armed with maps, good optics and a tankful of gas, hunters will drive through their chosen area early in the morning and watch for birds hitting feeding fields. When a concentration is found, then the landowner must be located and approached for permission. Congeniality is a hallmark of prairie life, and locals generally welcome visiting hunters. Mike and I got on the best hunt of our trip by stopping to visit with a farmer who was working on a tractor. We’d seen ducks and geese hitting a pea field along a section road near his house. He owned the field and gave us permission to hunt it. But then he mentioned another field that he felt would offer better shooting. We checked it out, and it was loaded with mallards. The next morning we enjoyed a quick-limit shoot. If possible, you should locate several possibilities, then recheck the best spots again in late afternoon to make a final choice of sites for hunting the next morning. Also, it’s important to determine exactly where a flock is feeding, not just the general area. One good strategy is to observe at a distance until the geese or ducks fly back to their roosting site at dusk, then make a quick foray onto the field to pinpoint their feeding location. Taking a GPS reading or leaving a flag in the field will ensure that you can return to the precise spot before dawn the next morning. This is when the payoff comes. Decoys and layout blinds are set out, and blinds are camouflaged with field stubble to blend into the scenery. Allow plenty of time to complete these tasks before first shooting light. Ducks typically come in the twilight of dawn, while geese will arrive up to an hour later. The same general strategy works for hunters wanting to shoot over water. Scout for birds, then move in and set up where they’re working. Some of the best hunts for ducks take place on small potholes where these birds go after feeding. Mid-morning scouting is essential for finding these often-overlooked opportunities. A freelance hunting trip on the northern prairie can be both recreational and instructive for retrievers as well as hunters. Here, thanks to big concentrations of birds and liberal bag limits, a dog will get a lot of retrieving experience in a short amount of time. A retriever travels well in a padded, insulated dog crate. When driving, pull off every three hours or so to allow a dog to “air out.” Offer water periodically, and feed before bedtime. You can bring the dog into your motel room at night (if allowed), or you can bed him in his crate, but only if the crate is inside a locked vehicle or trailer. The only requirement for a hunter to take his retriever into Canada is proof of a current rabies vaccination. Without such proof, canine entry will be prohibited by Canadian customs. If a retriever is traveling by air, the airline will require a recent health certificate (including proof of rabies vaccination). Hunters should see their local veterinarian to obtain this certificate. The northern prairie is beautiful in its vastness. It’s not uncommon to see many miles to a far horizon. And scattered here and there are gatherings of geese and ducks, the sizes of which will stagger first-time visitors to this region. Many of these birds are hatched and raised locally. Others come from nesting grounds farther north and stop over temporarily before heading on south. When a big flight takes wing over a feeding field or roost area, the sky can literally grow dark with birds. 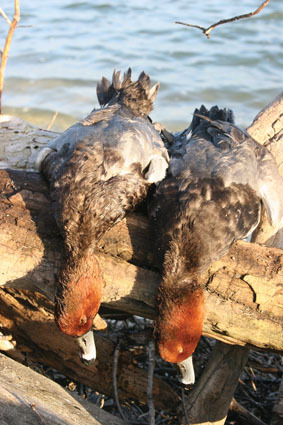 Hunting these prairie waterfowl is about more than shooting. It’s about witnessing the timeless pageant called migration. It’s about seeing and hearing one of the grandest spectacles in nature. And it’s about satisfying the urge many hunters have to go to the source of what they love so much so they can understand it better. Each fall the northern prairie beckons me, and I’ve answered this call many times. Haunted by memories of great hunts, I’m compelled to go back to continue my personal waterfowling odyssey, and God willing, I’ll return once again when the cool October sun falls across the grain fields. American hunters heading into Canada must fill out a Nonresident Firearms Declaration to bring hunting guns into the country. Declarations can be obtained online (www.cfc-cafc.gc.ca/online-en_ligne/form-assistance/indiv_forms/909_e.asp) and completed ahead of time. Or, hunters can obtain the form and complete them as they pass through Canadian customs. There is a fee of $25 (Canadian) per form, which can include two guns. Also, hunters may import 200 rounds of ammunition into Canada duty-free.